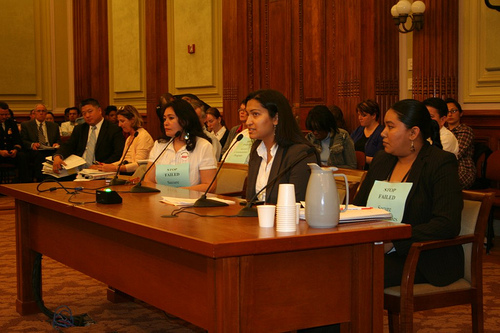 On March 19, 2010 nearly 200 people packed the Metropolitan Police Oversight Hearing at the DC District Council with “Moratorium Now” stickers and signs that read “Stop the Failed Secure Communities” program. Their questions and testimonies uncovered the truth on a failed program that threatened to erode public trust, hurt community policing efforts, open the door for racial profiling, and overturn the city’s rich history and pro-immigrant policies. Through their strong organizing and advocacy they were able to delay the program’s implementation. This marked a partial victory in their campaign to completely reject the program in their city. These efforts are the work of a broad coalition that includes labor, civil rights, community, immigrant, domestic violence and faith groups. Some participating groups: DC Jobs with Justice, The Latino Federation, Empower DC, Latino Action Coalition of DC, National Capitol ACLU, Different Avenues, Rights Working Group, DC Latino Caucus, The Latino Association of Mt Pleasant, Mil Mujeres Legal Services, Mary’s Center for Maternal and Child Care, CARECEN, DC Trans Coalition, Capital Area Immigrants’ Rights Coalition, National Immigration Project, National Day Laborer Organizing Network and over 100 community and civil rights organizations. Fox news report. Begin watching at minute 1:35 to 2:24. This entry was posted in Events, Events (Washington, DC), Media, Photos, Video on May 3, 2010 by Ian.